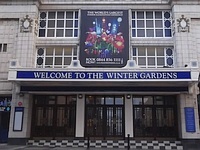 The Winter Gardens Blackpool has entertained and welcomed crowds of revellers in its collection of theatres, ballrooms, exhibition halls and public spaces, since opening in 1878. Amongst its many venues is one of the UK’s largest theatres, The Opera House, which has a capacity near 3000. The Opera House continues to attract the biggest touring shows and events from across the globe. 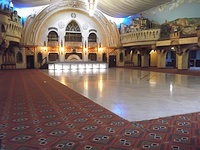 The adjoining internationally revered Empress Ballroom is home of the Blackpool Dance Festival, PDC World Matchplay darts, iconic gigs and many more illustrious events. 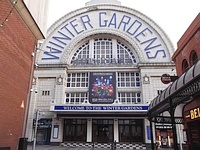 The Winter Gardens Blackpool is committed to delivering an eclectic and popular range of events, shows and conferences from around the world. 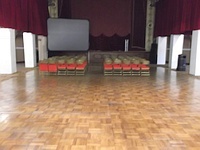 Services / facilities within the building include Opera House Theatre, Empress Ballroom, Arena, Horseshoe/Pavilion, Conference Halls, Function Suites, Meeting Rooms and Olympia Exhibition Hall. 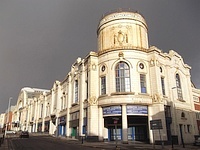 The Opera House Theatre is to the north east on Church Street and can also be accessed via ramp or steps to the stalls from the Floral Hall. 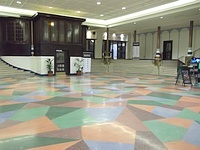 The Olympia Exhibition Hall (Illuminasia) is to the south from the main entrance foyer and accessible entrance. 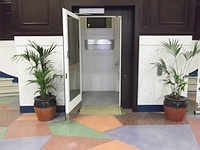 It can also be accessed using the Floral Hall lift near the West Horseshoe. 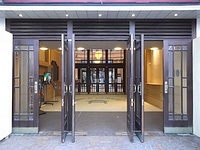 Please contact the venue for details of opening times, opening times do vary depending on performances and Opening times for the venue vary according to bookings/events taking place. The times above are for the Winter Gardens main building. Please check website for event times. The nearest National Rail station is Blackpool North. The name of the car park is Tower Car Park. 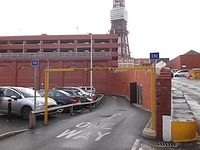 The car park is located across from the building on Coronation Street. 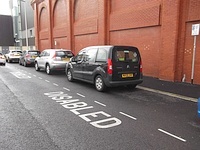 The second photograph shows the Blue Badge parking within the car park. There is a 2.3m height restriction. 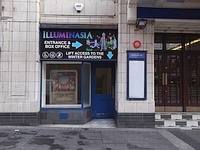 You are on Outside Access (Church Street Entrance). Skip to the next section. This information is for the entrance located on Church Street. The door opening is 138cm (4ft 6in) wide. 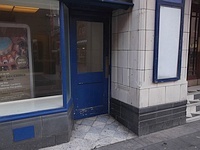 This information is for the entrance located on Coronation Street. 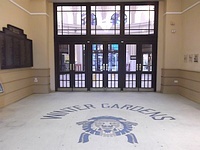 This information is for the entrance located at the front of the building, to the left of the main entrance. The door opening is 85cm (2ft 9in) wide. 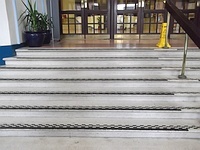 The width of the ramp or slope is 85cm (2ft 9in). You are on Lift (Accessible Entrance). Skip to the next section. 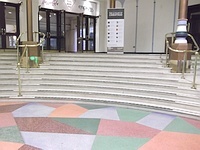 The lift is located just inside the accessible entrance. 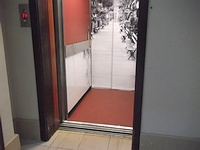 The floors which are accessible by this lift are G-UG. 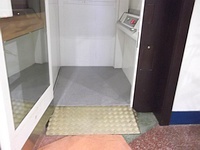 The lift is 2m (2yd 7in) from the accessible entrance. The dimensions of the lift are 110cm x 150cm (3ft 7in x 4ft 11in). 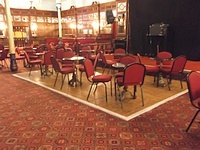 Music is played in various parts of the venue. You are on Level Change (Main Entrance Foyer). Skip to the next section. 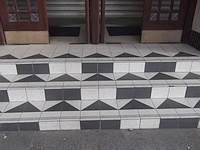 The step(s) is / are located to the rear right of the foyer, near the platform lift. You are on Lift (Main Entrance Foyer). Skip to the next section. The lift is located ahead as you enter. 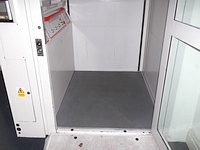 The lift is 19m (20yd 2ft) from the accessible entrance lift. 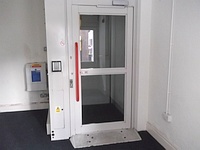 This lift is around 130m from the Church Street entrance on the upper ground floor. You are on Floral Hall. Skip to the next section. 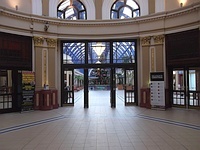 The Floral Hall is located in the main arcade. 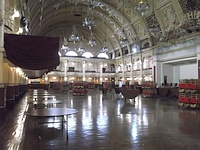 The main restaurants and bars are located off the Floral Hall. 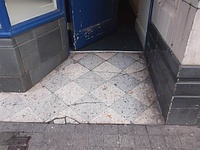 There is level access from the Church Street entrance. 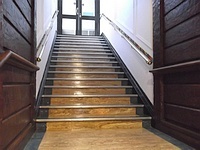 There is level access from the Coronation Street accessible entrance and foyer via the lifts. 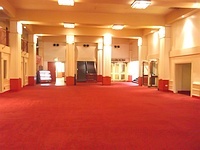 You are on First Floor Function Halls. Skip to the next section. 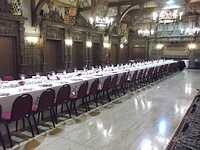 The Baronial Hall, Spanish Hall and 2 other large function suites are located on the first floor which can be accessed via lift near the West Horseshoe off the Floral Hall. 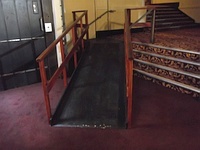 The main stairs leading up are located just inside the Theatre Bar off the Floral Hall marked 'Spanish Suite'. 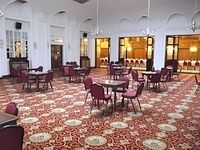 There are also ground floor function suites/meeting rooms located off the main entrance foyer. You are on Horseshoe and Pavilion. Skip to the next section. 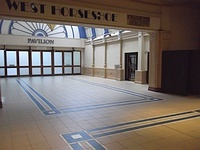 The 'Horseshoe' shaped hall is located off the south of the Floral Hall and surrounds the inner pavilion. 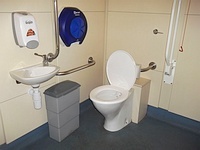 There is an accessible toilet and level access standard toilets available near the lift at the West Horseshoe. 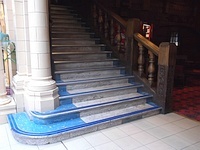 There are further standard toilets down the stairs shown at the rear of the horseshoe. 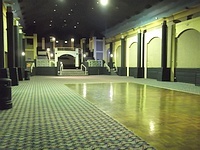 You are on Arena and Empress Ballroom. Skip to the next section. 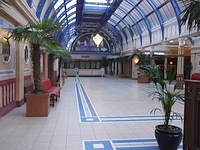 The Arena is located to the east from the Floral Hall and the Empress Ballroom is to the south east of the building. As it is further away, a ramped entrance near Adelaide Street/Leopard Grove can be arranged in advance. 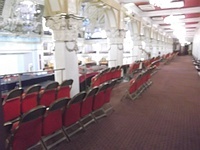 The Ballroom balcony can be accessed via the rear lift, although the very upper 'Gods' balcony floor is only accessible via stairs. 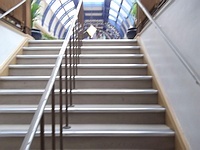 There are some clearly marked steps in this area which can be overcome by ramps with handrails on both sides. 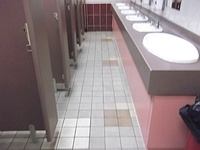 There are accessible toilet cubicles within the standard toilets next to the Ballroom. 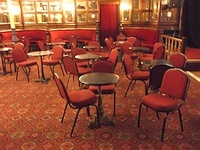 You are on Eating and Drinking (Theatre Bar and Galleon Bar). Skip to the next section. 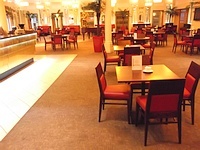 The nearest table is 25m (27yd 1ft) from the main entrance foyer lift. 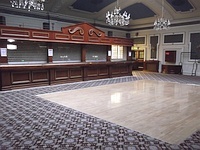 The Theatre Bar is located opposite the stalls near the level access Church Street entrance. 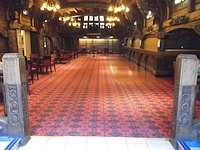 The adjoining Galleon Bar, which is towards the main entrance foyer lift, is opposite the West Horseshoe/Pavilion entrance. Both of these bars surround and link through to the Mazzei Cafe off the Floral Hall. 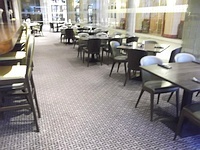 You are on Eating and Drinking (Mazzei Cafe). Skip to the next section. 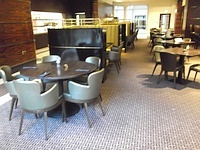 The nearest table is 30m (32yd 2ft) from the Coronation Street entrance foyer. The type of food served here is various hot and cold snacks. You are on Eating and Drinking (Empress Grill). Skip to the next section. The following information is for the restaurant/bar. 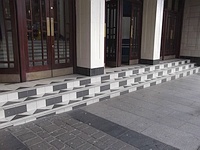 The nearest table is approximately 69m (75yd 1ft) from the Church Street entrance. 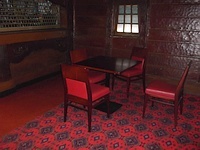 The distance between the floor and the highest table is 99cm (3ft 3in). 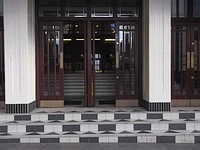 The Empress Grill is located to the south of the Floral Hall near the Horseshoe, around 25m from the main entrance foyer lift. 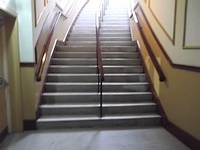 There are many sets of similar stairs throughout the venue. 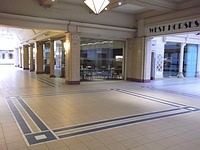 The lift is located next to the West Horseshoe/Pavilion doors off the Floral Hall. 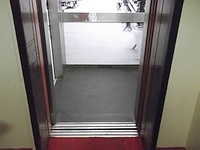 The floors which are accessible by this lift are B-UG-1. The dimensions of the lift are 94cm x 150cm (3ft 1in x 4ft 11in). 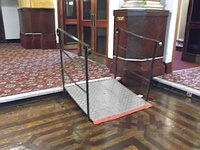 This lift can be used to accesses the Olympia Exhibition Hall on the lower ground floor and the first floor Baronial Hall, Spanish Hall and upper floor function rooms. 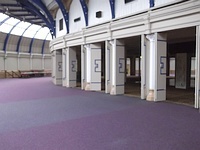 There is a similar rear lift near the Empress Ballroom. You are on Accessible Toilet (Ground Floor). Skip to the next section. There is pictorial signage on or near the toilet door and There is written text signage on or near the toilet door. 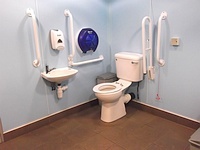 The accessible toilet is 29m (31yd 2ft) from the main entrance foyer lift. 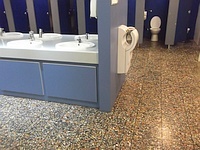 The accessible toilet is located next to the West Horseshoe/Pavilion doors off the Floral Hall. 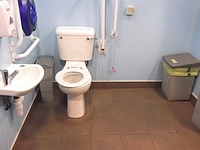 The dimensions of the accessible toilet are 280cm x 470cm (9ft 2in x 15ft 5in). Baby change facilities are located in the smaller accessible toilet to the left. 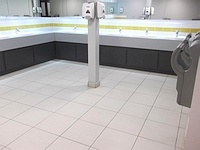 The accessible toilets are 102m from the level access Church Street entrance. 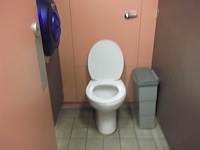 The smaller accessible toilet has 55cm space to the left and has a locking handle. 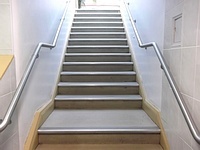 You are on Accessible Toilet (First Floor). Skip to the next section. 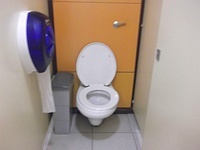 The accessible toilet is 5m (5yd 1ft) from the lift. 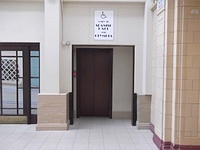 The accessible toilet is located on the first floor towards the function halls. The width of the accessible toilet door is 68cm (2ft 3in). 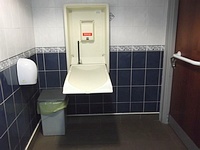 The dimensions of the accessible toilet are 175cm x 180cm (5ft 9in x 5ft 11in). As you face the toilet the wall mounted grab rails are on the left. The height of the sink is 75cm (2ft 6in). 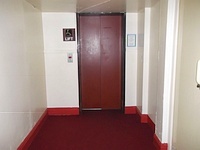 The door is 68cm wide at a height of 100cm due to a grab rail, otherwise it is 74cm wide. 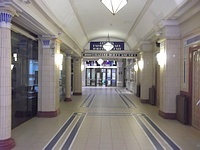 The female and male toilets are located in the main area of the Winter Gardens. 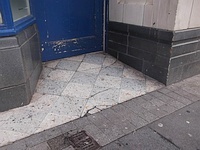 The female and male toilets are 63m (68yd 2ft) from the Church Street entrance. The height of the baby change table once extended is 76cm (2ft 6in). 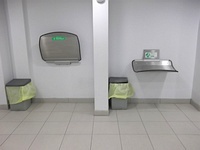 There are further standard male and female toilets next to the Pavilion Hall and within the Theatre. 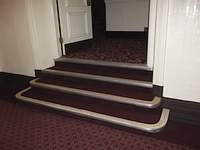 The step(s) is / are located leading down to the standard toilets.